This game involves puzzle solving, while creating wacky machines. 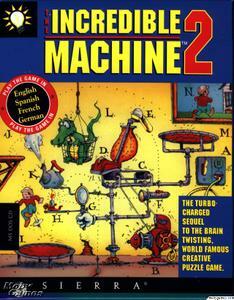 Each level of the game contains a machine designed to do a specific task. The only problem is, there are parts missing, and it is your job to figure out where to put what in order to get the machine to work. The game features many wacky machine parts, including cats, super balls, lava lamps, flashlights, can openers, monkies on tredmills, and many more wacky parts to get your machine working. The game also comes with an editor to let you design your own unique machines from scratch. These can either be for fun, or you can set it so that the person playing has to fill in the missing parts, just like the campaign.